Check out the Project Overview below, and then browse our pages. Let us know if you have any questions! ​Our school has a fence around the perimeter of our property and provides a tangible boundary for most students to play just fine in the open field that serves as our play area. However, for a smaller population of our students with special needs, playing with friends in our school's play area has never been a reality. Stay and Play will provide a recreational area with tangible boundaries for both their safety and comfort and also be inclusive so that all students are welcomed. 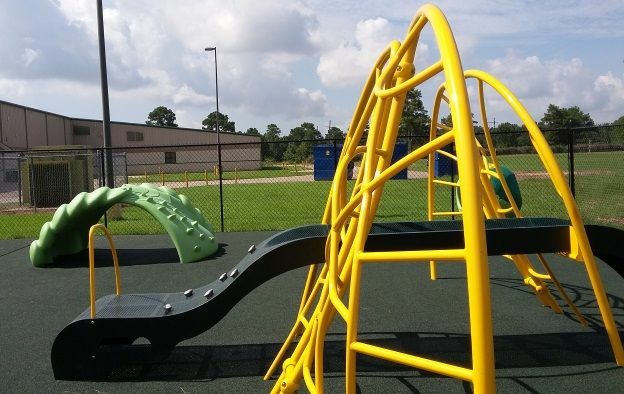 Students with special needs at our school will be able to play in a recreational area designed specifically for them! Stage 1: The Fence- 6 ft fence installed around a 40 ft X 40 ft area across from students' classroom provides them with the boundaries that will keep them safe, while encouraging them to explore their environment. The location promotes familiarity and increased comfort level. This stage has been completed through grants and donations made to Stay and Play. UPDATE: ​ Stage 2 is under construction. So far the equipment has been purchased and installed. The pour rubberized surface has been poured and is in place. The walkway to Stay and Play is now complete. The raised grass pad is currently under construction. Once this is complete, the additional fencing will be added and Stay and Play will be open following a Ribbon Cutting Ceremony! Demonstration to our students and community our belief that all children are special and deserve the right to learn through play and physical activity. Allow students to discover through sensory play to discover their world and how to be successful in it. Not only does a playground engage the core senses, it also allows for development of other sensory skills that are essential to healthy development. Allow more peer to peer social interaction between students in the general population and students with special needs. We've already seen a committed partnership in our general education population to be involved with those with special needs. Our recreational area would allow this to be extended even farther, beyond the four walls of our building to the outdoors, because everyone deserves a place to play and interact socially with others! This would give provide opportunities to discover there are more similarities than differences!